Eric Stockwell was bitten by the winemaking bug in the early 2000’s. While running his own welding and metal fabrication business, he started making wine at home. Over the next decade he honed his skills and increased his yield. Through exploration and experimentation, he eventually came to focus on creating unmanipulated single varietal wines using Old World techniques. By 2014, it was clear that his passion for winemaking had blossomed into the makings of another business. That spring, he cleared out the back half of his westside Santa Cruz welding shop and opened Stockwell Cellars to an appreciative public. Today, the winery has entirely taken over the building where Eric used to have his metal shop. Wood and steel tables and bars adorn our tasting room—all handmade by Eric. Comfy couches fill out lounging areas where people can kick back and relax beneath the soft glow of suspended lights crafted in Eric’s shop. Passionate supporters of local artists, the Stockwell Cellars tasting room also serves as a gallery space. It’s an inviting place to spend an evening with friends, sipping wine, enjoying the latest art, and grooving to live music. While Eric is our winemaker, his wife and co-owner Suzanne runs the tasting room and wine club, along with organizing a variety of arts and culture events. Prior to Stockwell Cellars, she handled direct to consumer sales and event coordination for a well-respected local winery. Due to her experience, she is always up on the latest developments in the industry and occasionally suggests new wines for Eric to create. Eric may be the winemaker/welder, but Suzanne’s fire and gregarious personality draws people together at Stockwell Cellars. 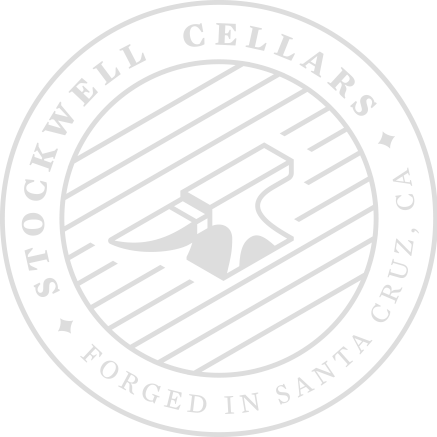 Born and raised in Santa Cruz, Eric’s daughter Jessica is also an integral part of Stockwell Cellars. She does a little bit of everything, from crushing grapes to co-hosting events. Having worked her first “crush” in 2015, her passion for wine has lead her to become a Certified Sommelier. Together Eric, Suzanne, and Jessica make Stockwell Cellars a truly unique experience among the burgeoning urban wineries in Santa Cruz. They combine Old World winemaking techniques to produce both traditional and unexpected high-quality wines served in a down-to-earth tasting room. Proud to be among the growing urban winery scene in Santa Cruz, our warm and welcoming tasting room feels more like a brewpub than a stuffy winery. Handcrafted wood and metal tables, made by our metal-worker founder, mingle with local art and relaxing sofas nestled among dancing firelight. Lounging in our tasting room is a little like gathering around a modern version of the village smithy.